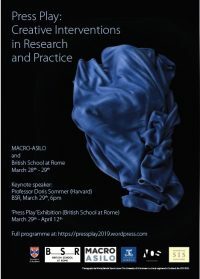 Members of the Society for Italian Studies are invited, via a call posted on the Society’s webpages and circulated to Departments, to submit proposals to host the Interim Conference on a biannual basis. The Society provides funding of up to £1000 to support the event, as well as supporting the conference organisers in planning, publicising and running the conference. *Call for proposals for the SIS Interim Conference 2020*: if you have an idea for the Interim, please get in touch with Dr Emma Bond. We will be looking for intellectually robust and timely ideas.